I'm someone who fell in love with science and the natural world relatively late in life, which is one reason I'm convinced that researchers should share the wonder and excitement of their work with non-scientists—you never know how big an impact you'll make on someone's path! 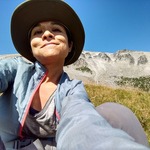 As a Ph.D. candidate in the Hille Ris Lambers lab, I study the impact of climate change on interactions between plants, insect herbivores, and pollinators in montane meadows. I've been working with MeadoWatch since 2015 and I love our volunteers because they are so passionate about learning about and conserving this very special habitat. What are the patterns and effects of American crow movements? We did it!! And a small surprise. It's the 21st century—why are we still using drawings for species ID? Extension!!! And a baby marmot. Hoping you guys make progress towards your stretch goal in the last 6 days—love to Wilmer and Humbert!!! Thank you so much, Andrew!! That's so cool that you have Earthwatch volunteers work with you, Danielle! Thank you for taking the time to find me and share your kindness. Good luck right back at you! We really hope so too, Jennifer!! We appreciate all your support! Wish it could be more—good luck with your campaign! Awww, thanks for asking, Cindy! we usually announce orientations sometime around the end of March/beginning of April, and they take place in June. You should sign up for our mailing list, so that you get an email as soon as the dates and times are set—then you can register! The link to sign up is here: https://mailman12.u.washington.edu/mailman/listinfo/mwatch_volunteers I will put this info on the project page. Thanks! Really wish it could be more! Good luck. Wish it could be more. Good luck!